The Isoglue adhesive has been designed for ideal use with polystyrene, polyurethane and medium-density fibreboard (MDF) substrates. Isowall has created Isoglue to fulfil all the adhesive needs for interior decorating solutions such as cornices, skirting boards and dado rails made from viable alternative materials to hardwood. Where can I use Isoglue? Isoglue can be used as a glue/adhesive for cornices, skirtings and dado rails – and as a rigid cementitious filler that can be painted when dry. 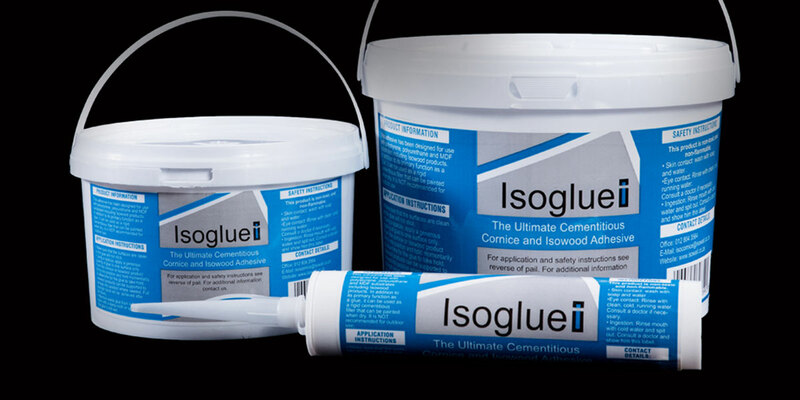 We recommend Isoglue for our Isowood extruded skirting boards and dado rails. Click here for a quick guide on how to install Isowood products. 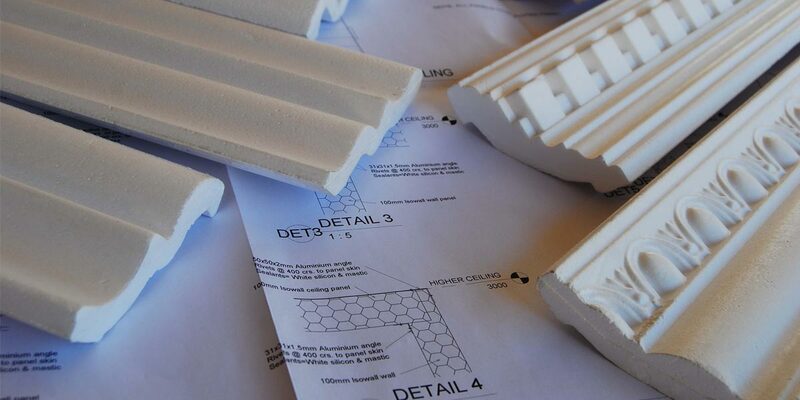 You can also apply Isoglue to our decorative cornice range Isocornice. Click here for a quick guide on how to install Isocornice products. Isowood produce extruded skirting boards and dado rails, which come in standard 3 meter lengths, for the built environment market. Isowood products have a ‘wood like’ appearance and pose as a viable alternative to hardwood. Isowood is manufactured to a finished shape and colour; therefore, avoiding the use of chemically based stains, paints and solvents – which are typically used to treat hardwood products. How do I apply Isoglue? Apply a generous coating of Isoglue to one surface only at a time, using a spatula. Arrange the product (Isocornices or Isowood) firmly into position and hold down to allow sufficient time for the glue to hold. Remove any excess glue from substrates and tools with a damp cloth or sponge while the glue is still wet and before it hardens. Wait 24 hours to achieve a full strength bond. Adhesives can be often toxic and harmful when in use, requiring extra precautions during product installation. It is not the case with Isoglue. The Isoglue adhesive was formulated to be non-toxic and non-flammable. Simply rinse the excess glue with cold water when in contact with skin or eyes. Seek medical attention if ingested and when needed. Isoglue is available from our Factory Shop and comes in 320ml slugs or 3kg and 5kg tubs. The product is recommended for indoor use only. Isowall manufactures Isocornices decorative cornices, and Isowood extruded skirting boards and dado rails to a finished shape, colour and style. Isowood produces extruded skirting boards and dado rails to a finished shape, colour and style. 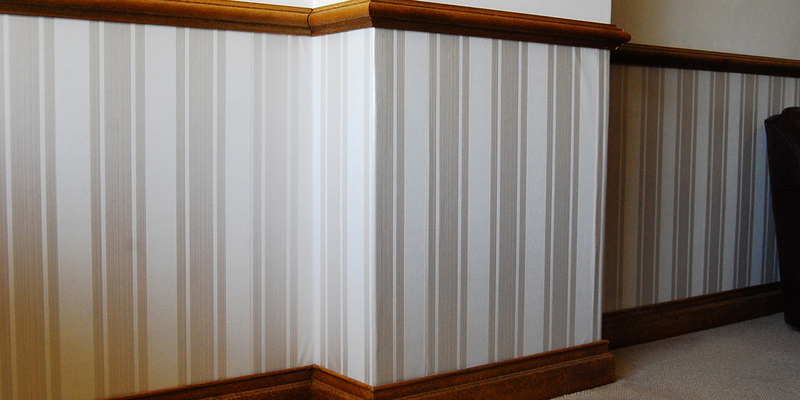 Click here to find out ways to decorate with Dado Rails. Isocornice decorative cornice range can add formal or casual elements; develop a sense of scale; incorporate and enhance architectural features of any room.